No history of the independence referendum will be complete without detailing the sheer excitement, energy and engagement the vote stirred up across Scotland. From queues outside registration offices on deadline day to the ubiquitous pin badges, and campaigns that touched every corner of the country, this was uncharted territory for electoral politics. In the end, 97% of the eligible population were registered, turnout hit a record 85%, and civic Scotland gushed to itself that regardless of the result, hadn’t this been a wonderful and enlivening experience, and wasn’t it just delightful that everyone cared about politics again? As many of us understood from early on, the referendum had a clear class dynamic to it, and getting a high turnout in housing schemes and former industrial towns would be pivotal to securing independence. In the end, it was working class areas that did vote Yes – and in those areas, huge numbers of people signed up to vote for the first time. The election captured the public imagination to such an extent that hundreds of thousands of people put aside worries about debt repayment firms, bailiffs and historic tax dues to get signed up to vote. 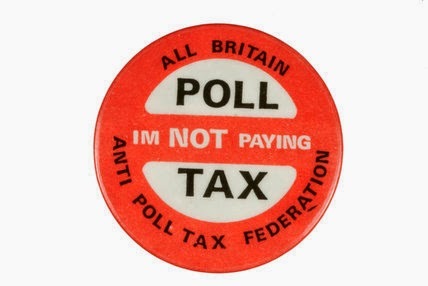 The Poll Tax was, after all, abolished over 21 years ago. A word about demographics: people with Poll Tax or Council Tax debt, particularly those who’ve gone to extreme lengths to avoid paying up, are much more likely to be on lower incomes. They are therefore far more likely to be Yes voters – that’s a fact. It’s now time for payback – at least according to the “Better Together” councillors in Aberdeenshire. The local authority is run by a coalition of Conservatives, Lib Dems, Labour and several independents, bound together by their collective hatred of the nasty Nats. The SNP would otherwise lead the council, possessing the largest number of seats by a long shot, but instead find themselves in opposition with the Greens. On Monday, Aberdeenshire Council announced that on the back of the unprecedented rise in voter registration ahead of the referendum, they would be trawling through their records to pursue 25 year old Poll Tax debts, just in case any non-payers had had the audacity to re-register to vote. It’s hard to know where to begin with how awful this is. Non-payment of the Poll Tax was not an act of self-interest or greediness, but a principled stand as part of a mass campaign, which would eventually bring down both the hated tax and Thatcher herself. 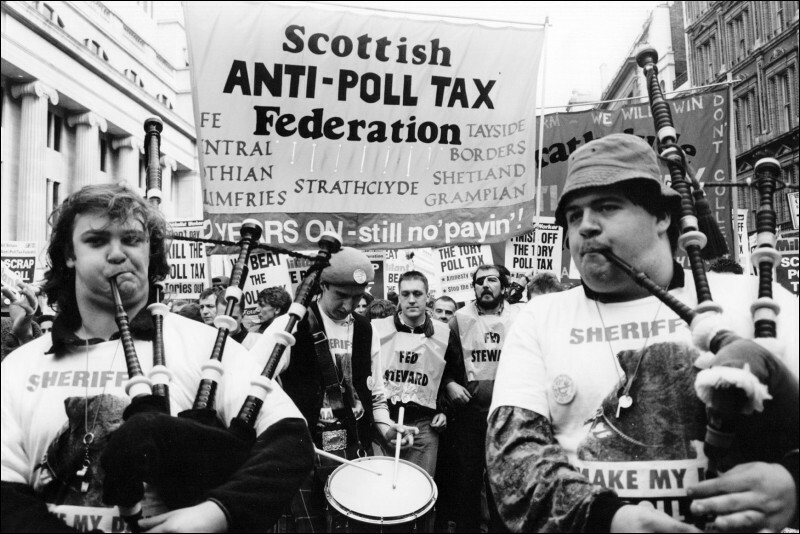 To this day, a popular folk memory exists around the Poll Tax and the non-payment campaign in Scotland – a mass, grassroots, community-led movement of the kind that people who were there never shut up telling you about. It would be blasé to compare it directly with the Yes movement, but both were rooted in communities with huge participation from ordinary people. It’s an ironic twist that the same Tories are now so keen to put down our new found democratic revival by harking back to the legacy of one of the last big working class struggles in Scotland. It’s usually the left that dredges up the subject of the Poll Tax at any available opportunity – emblematic as it is of unpopular policies being foisted on Scotland by governments we didn’t elect – not er, the Scottish Conservatives. Scotland was first to be punished with the Poll Tax, with it introduced here a year before the rest of the UK. Scotland has also been last, with debts in England and Wales expiring after just six years. Here, they remained valid for 20 years, and if they were formally acknowledged during that time, were then extended for the same period again. Although some councils have written off their debts entirely, others – like Aberdeenshire – could in theory be chasing them until 2033. According to Government figures, Scotland also had ten times as much Poll Tax debt as England on a per capita basis, which illustrates the sheer strength of the non-payment campaign north of the border. Various plans have been forward over the years for abolishing historic Poll Tax debts, yet this has never been enacted at a national level. In reality, all this has been meant is the wholesale disenfranchisement of working class people who bravely stood up to the Poll Tax between 1989 and 1993, and for whatever reason can’t or don’t want to settle their debts. Aberdeenshire’s Tory councillors don’t care: they really will stoop as low as using Scotland’s democratic revival and the mass engagement from working class voters in the indyref as an excuse to start chasing ancient debts for a widely derided and unjust tax. 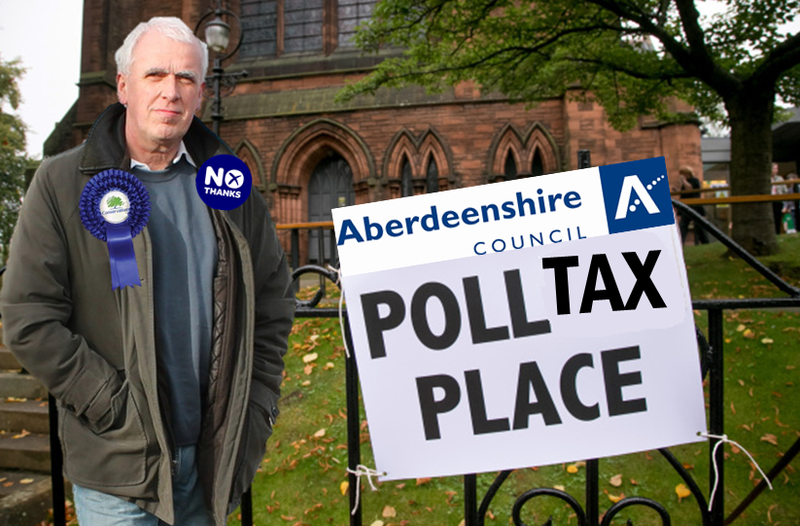 And if that puts off people from showing up at the voting booths again, then all the better: call it Aberdeenshire Council’s new Poll Tax. That doesn’t apply to council tax or poll tax. As the article details, the cut off remains 20 years, which can be further extended for 20 years if it’s acknowledged during that time. So is this the wounded getting bayonetted? I think Iain Davidson should be informed and offered to give his opinion.